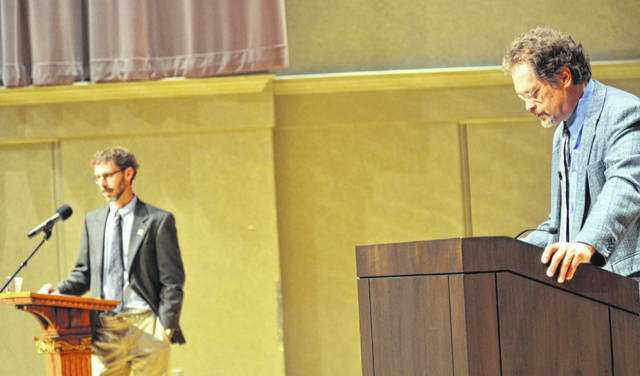 Dr. Perry Bush, right, prepares his rebuttal to points prepared by Dr. Jonathon Andreas, left, during Bluffton University’s annual Constitutional Day Forum. BLUFFTON — As part of Bluffton University’s series on civic engagement, Dr. Jonathan Andreas, professor of economics, and Dr. Perry Bush, professor of history, took to the stage at Yoder Hall late Tuesday morning to discuss the pros and cons of the 14th Amendment — the constitutional guarantee of citizenship if someone is born on American soil. But as both Andreas and Bush presented, repealing the constitutional amendment would create more problems than it would solve. “Today, the 14th Amendment is obsolete, and there’s a lot of feeling from Americans that the system is unfair,” he said. Other benefits of nixing the amendment, he said, include an increased sense of national community while eliminating the current practice of “birth tourism,” where upper class internationals will travel to the United States to have children to ensure their offspring will have the rights of American citizens. Bush countered Andreas’ points by saying that birth tourism is a much more exaggerated problem, and statistically, the number of women traveling to the United States to have children is negligible. He also argued that the 14th Amendment also upholds a unique value of American culture — the diversity that has been encouraged from welcoming individuals from all nations. Both individuals agreed the 14th Amendment is not, however, what is causing illegal immigrants from entering the country. Neither were a fan of the “anchor babies” terminology, as naturalization is actually a simpler process than raising a child until they come of age. Bluffton University spokesperson Tricia Bell said the forum was held in part to model what respectful civic dialogue between two individuals can look like in a time of major political division.